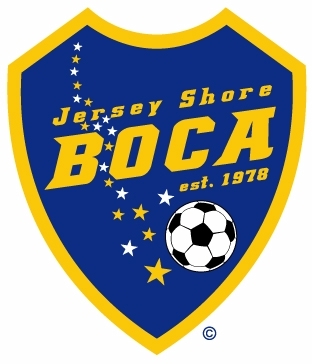 Six different Jersey Shore Boca teams competed in thirteen great games this past week combined between the Super Y-League and Mid-Atlantic Summer Showcase League. For the Boca U23s and U19s, the 2004 summer season is winding down while other Boca teams compete for SYL playoff spots plus much more in this week’s edition of the Boca Soccer Wire. The Boca U23s participated in the MSSL Festival at Ft. Dix this past weekend. On Saturday Boca first squared-off against Cherry Hill. The U23s out shot Cherry Hill 12 to 3 and did everything but put the ball in the back of the net, missing 3 or 4 legitimate scoring opportunities as Cherry Hill took the match 2-0. Both Cherry Hill goals were scored from 40 yards away which caught Boca GK Jon-Curry Edwards off his guard a bit. The U23s dropped their second match of the day at Ft. Dix 3-0 to the Manhattan Kickers. On Sunday, the U23s jumped out to a 2-0 lead against the powerful Conn. Strikers on goals from Joe Cutler and Goreleigh Willis. Boca held the lead mid-way through the second half until the Strikers put three goals past Boca GK Sean Grayson to finish the scoring and end the game 3-2 in favor of Connecticut. The Boca U19s took on a strong Chesapeake Athletic side Monday night at the Manchester Soccer Complex. In a tough battle from the opening whistle, both sides felt each other out until Boca capitalized mid-way though the first half. Jim Coletti served a cross to James Mirarchi who made a run down the center. Mirarchi settled the ball and then laced it into the back of the net from 35 yards out which turned out to be the eventual game winner. Chesapeake had some good opportunities but could not make them count. Boca GK Steve Bukowczyk came up with several big saves to preserve the win and shut-out for Boca. On Saturday, the U19s traveled to take on division leader Super Nova in Pine Hill, PA. Although Boca had some scoring chances, they could not finish their opportunities with Super Nova taking the match 3-0. On Sunday, the U19s traveled south for a rematch with DC United. Boca lost a tough 1-0 match in their earlier meeting a few weeks back at the Manchester Soccer Complex. Although Boca tallied two goals against the perennial powerhouse in Sunday’s game, DC put 4 in the back of the net against Boca with the final result 4-2 in DCs favor. The U19s have two games remaining in the 2004 SYL season: Tuesday at Parsippany and Sunday at home vs. Northern Virginia. The Boca U16s traveled to Pine Hill, PA on Saturday to face powerful Super Nova. With goals from Cliff Willever and Nick Ciocco which were assisted by Kyle Altenau and Jamal Neptune, Boca topped Nova 2-1. On Sunday, the U16s completed their weekend tour with a trip to Reading to face the Rage. Although the U16s fought hard and played well the entire match, Reading came out on top 2-0. The U15s shadowed their older teammates and also went on a weekend journey to Super Nova and Reading. The U15s continued their unbeaten streak on Saturday with a 3-2 win over Nova. Joseph Sorrentino collected two goals and an assist with Nick Ciocco getting the other score and Luke Calvano tallying an assist. Boca GK Kevin McMullen held Nova at bay between the pipes to preserve the Boca win. On Sunday, Boca toppled the Reading Rage 4-0 to keep their undefeated record in tact with two goals by Kevin McMullen and one each by Nick Ciocco and Mike Christie. Ciocco, Jonathan Scheer and Max Hamilton each had an assist for Boca. With the win the Boca U15s improve to 9-0-1 and remain on top of the SYL U15 Mid-Atlantic Division with 3 games remaining to be played in the regular season. The Boca U14s took on their cross-state rivals, the South Jersey Barons on Wednesday night in Winslow Township. The U14s played well and eventually took the match 3-1, having out-shot the Barons by a 2-1 margin throughout the match. Coach Kirk Pericciuoli and the Boca U13s had their hands full over the weekend as they dropped a hard played match 2-0 to Super Nova on Saturday. The Boca U13s also traveled to Reading, PA on Sunday to face the Rage as did some of their fellow Boca teams. Although Boca did get on the scoreboard, it was not enough to outlast the Rage as they took the match 4-1. Next up for the U13s is a home stand at the Manchester Soccer Complex on Saturday against the Chesapeake Athletic Club and on Sunday against the Northern Virginia Royals.